Updated 2:12 p.m. | Posted 11:52 a.m.
Gov. 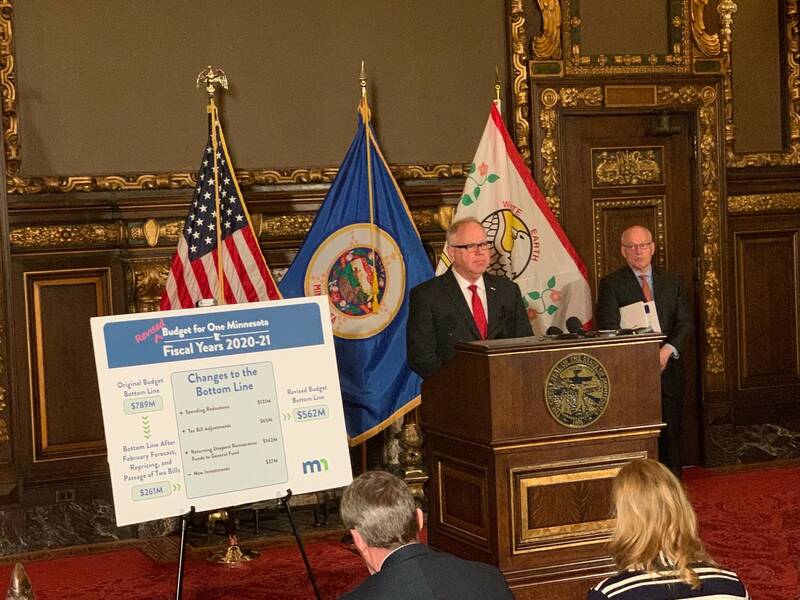 Tim Walz scaled back his budget Friday to account for a shrinking pot of money, although even those revisions leave a plan legislative Republicans still see as too rich. • Claiming $142 million in unspent money targeted for a reinsurance plan to reduce risk for health insurers in the individual market and returning it to the state's general fund. Republican legislative leaders had planned to use the money to extend the reinsurance program. Walz instead has a plan to subsidize insurance premiums by 20 percent. • Reducing spending increases by $131 million from his original budget proposal across a variety of areas. Those savings are slightly offset by $37 million in spending for a number of items not in the governor's original proposal. • Tax changes for businesses that add $65 million to the two-year budget. • Instead of leaving $789 million unspent as his original plan did, Walz now leaves $562 million on the bottom line. Overall Walz's revised budget totals $49.35 billion for the coming biennium, $121 million less than his original proposal. "We went through this line by line to maintain a balanced budget," Walz said. "At the end we are in a fiscally solid place for One Minnesota." Walz acknowledged that he wasn't recommending cuts to any existing spending rather trimming some of the proposed increases he had put forward earlier. "My initial proposal was well thought out, it wasn't pie in the sky," he said. On the reinsurance money, the governor said his move preserves crucial federal funding for the MinnesotaCare program that would be lost through reinsurance. Speaking of the Republican plan to extend reinsurance, he said "in a time of triage we slapped a tourniquet on the individual market" and now is time to reassess strategy. He didn't rule out supporting some version of that in the future, but said that must come with concrete assurances from insurance companies that resulting premiums will be lowered by the amount the state puts in. Unchanged in the governor's revised proposal are a phased-in 20 cent-per-gallon increase in the gasoline tax to fund road and bridge repairs and an extension of the 2 percent health care provider tax that is scheduled to expire at the end of this year. Schools in the state would also see the 3 percent per-pupil funding increase in the first year of the biennium and 2 percent increase in the second year that were included in the governor's original budget. In his revised plan, Minnesota's public colleges fare better than previously. Walz upped his recommendation for those areas by $25 million. The taxes are a major point of friction with Republicans who control the state Senate. House Republicans quickly criticized the governor's redo. "It's disappointing that Governor Walz has not backed off the most harmful elements of his budget — a billion dollar tax increase on Minnesotans' health care, and a crippling 70 percent gas tax hike," said House Minority Leader Kurt Daudt, R-Zimmerman. Senate Finance Committee Chair Julie Rosen, R-Vernon Center, said the governor and GOP lawmakers remain far apart on the fiscal direction of the state. "The way he is spending, this is unsustainable. We cannot keep spending like this," Rosen said, describing the Walz plan as missing real changes to how state services are delivered. "You keep that growth up, you can't tax enough." Senate Republicans will release their budget blueprint next week, which she said will "live within our means." Walz was required to amend his initial $49 .5 billion plan for the next two years after a late-February economic forecast showed a slide in the projected surplus. What had been a $1.5 billion expected balance became $1 billion. But even that might be misleading because forecasters aren't allowed to account for inflation in existing programs. The Walz budget is a starting point for deliberations over the next budget. The DFL-led House and Republican-controlled Senate will develop their own proposals in coming weeks before they and the governor's administration work to come up with a unified plan in May. Focus areas for Walz have been to give healthy back-to-back increases in classroom aid, creating a new public option for health insurance, deliver higher state allowances to local government and enhance access to broadband internet. Walz has also recommended targeted tax cuts through credits and subtractions, but not a reduction in income tax rates. The next budget must be in place by July 1 to avoid a disruption in state services.